Earlier in September my small group had the opportunity to serve an older couple in the church. They are getting ready to move in with their son, and are trying to get their house ready to sell. So, we were originally tasked with painting the garage with another small group. This task kept getting pushed back because of weather (which was fine with me because the original date it was scheduled might have been the hottest Saturday this summer!). So, when one of the men from the other small group went to look at the garage, he decided it needed siding instead of painting. So, we were later tasked with painting the trim, two side doors, and the actual garage door. And it was perfect fall weather for the day--high 60s. I even found an old school long sleeve shirt that I didn't mind getting paint on. And for those of you who might be wondering, No, I did not play in a flag football tournament. 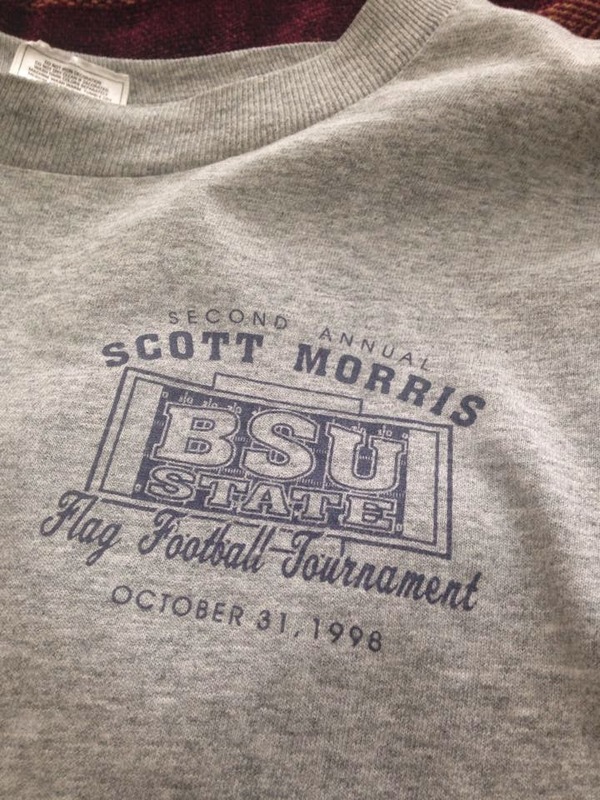 But I was an avid fan even way back in college, so they allowed spectators to buy the shirts too! Here's Diane taping the trim. Jack is in the background scraping the trim around the garage door. Nancy also got to tape some trim. I love Diane's face in this picture. She has one of the best laughs and I can almost here it when I look at this picture! And we got the doors hung correctly. It was a great day of much laughter. I love my small group and was so excited to get to serve with them. This project was special to me, too, because the couple we were serving was one of the first couple's I met in the church. When I first started attending Bethany, I was in a House to House group with them. House to House was a ministry, like small groups, that met on Sunday evenings for about 8 weeks. Lowell and Char were one of the couples in the group. And we met at a lady's house from the church who was one of the most senior of the saints at the church! While we were serving on this particular day, we were talking with Lowell and Char's son. He shared that they are both in their 90s. One of the sweetest things he said about his dad was that although some of his memory was beginning to fade and he could not always remember things, he always knows when something is good and he would appreciate the work we did serving. Lowell came out at the very end to talk with us and I was able to get a great big hug from him. I wasn't sure if he would remember me because I had not interacted with him for many years, but as his son was telling him our names, I heard Lowell say, "Teresa...I remember her!" It was so sweet. They are a great example of a godly man and woman who have served the Lord faithfully for most of their lives.